Using the Vehicle Envelope Method® (U.S. Patent No. 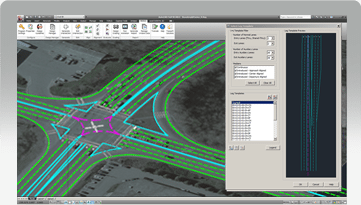 8,650,004) of design, NEXUS incorporates all the key elements in the intersection design process including design vehicles, capacity conditions, sight lines, conflict points, and conceptual grading – providing instant feedback so engineers can quickly and easily produce highly effective and safety oriented intersection layouts. PRÉSENTATION The Quickest and Most Intuitive Way for Designing Intersections NEXUS was developed to give engineers the ability to quickly and efficiently create intersection layouts with pre-generated templates and sophisticated editing tools that continually update the intersection as design changes are made. The interdependent geometric elements of an intersection are updated as soon as the design is modified. 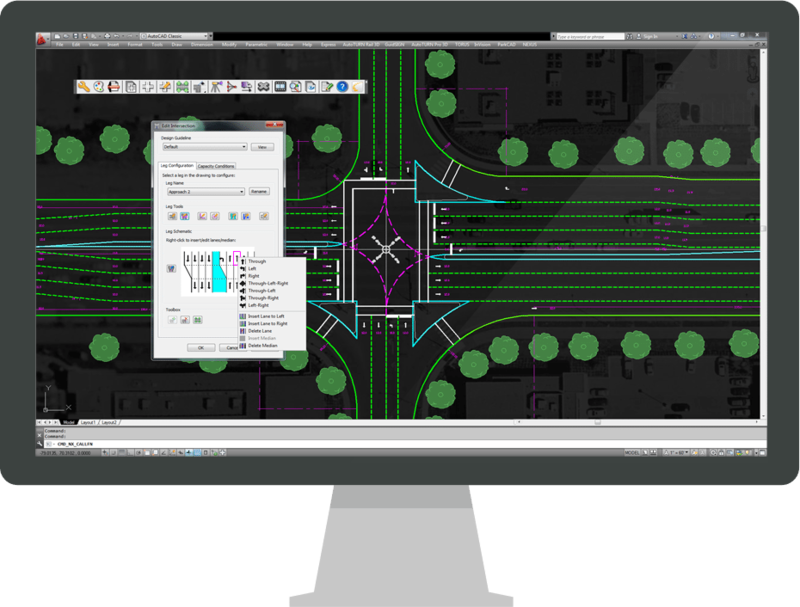 Changes such as adding a left turn lane or increasing the storage length of an auxiliary lane will update all of the intersection geometry allowing designers to explore different concepts or immediately react to changes. 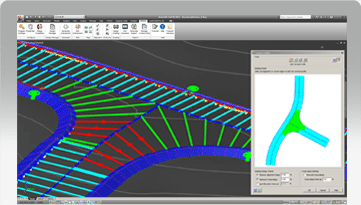 NEXUS was developed to give engineers the ability to quickly and efficiently create intersection layouts with pre-generated templates and sophisticated editing tools that continually update the intersection as design changes are made. https://transoftsolutions.com/wp-content/uploads/2016/03/NX_NEXUS2_leg_template_big.png Overview WORK WITH INTERSECTION LEG TEMPLATES Visualize different design alternatives faster by using pre-defined leg templates. With over 450 templates to choose from, engineers can easily filter (by the number of entry and exit lanes) through the entire library to work with specific templates applicable for their projects. https://transoftsolutions.com/wp-content/uploads/2016/03/NEXUS2_3Dgrading_access_5_big.png Overview AUTOCAD® CIVIL 3D® INTEGRATION NEXUS can now generate Autodesk® AutoCAD® Civil 3D® surfaces, vertical, and horizontal alignments. Civil 3D objects (such as corridors) are updated dynamically using the NEXUS grading model. With the new support, engineers can assess the intersection footprint based on the 3D grading design.